Today is my birthday and tomorrow is Mother’s Day. They always fall close together or on the same day, so every year I have the choice of combining them and getting an extra big gift 🙂 This year it wasn’t hard to convince my husband that it should be my very own sewing space. Sewing at the kitchen table has its charms. It has allowed me to sew while my kids played in the backyard or downstairs. I will miss the convenience of having my machine in the middle of it all but I have really outgrown my space and it is time to find it a better home. Here is what my kitchen looks like now. Eek! Pretty crazy huh! That’s not even half of it. 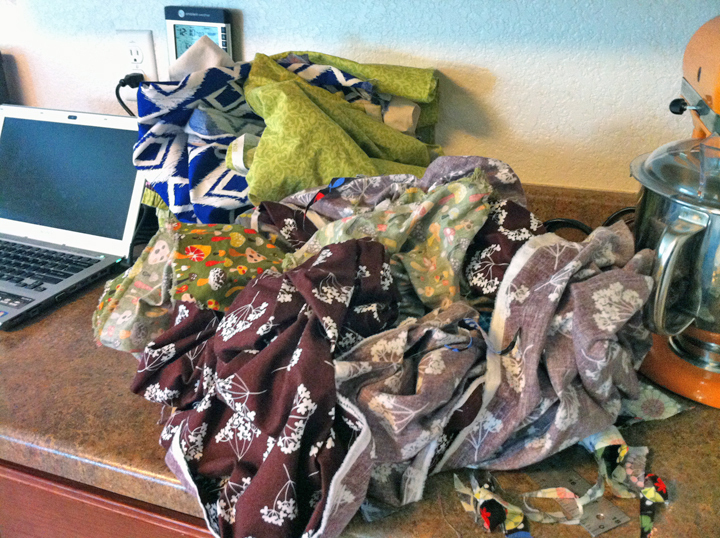 I have other piles of fabric elsewhere. Its a mess and I am always searching for something. So here is where I am going to be moving to (with more piles of fabric). and here is my Pinterest board I am using for inspiration. Anyone have any ideas they would like to share? Feel free to post links to your own sewing spaces in the comments or on my Facebook page. Posted on May 11, 2013 by mamacansew. 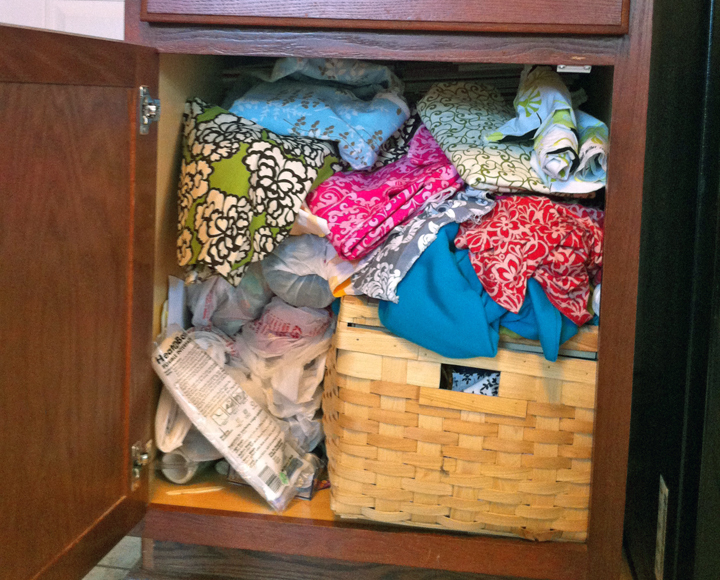 This entry was posted in sewing space and tagged fabric storage, sewing room, sewing space. Bookmark the permalink. Make sure to have a guest chair so the kids can work on their own crafts with you from time to time. Or a friend. Just sayin’. 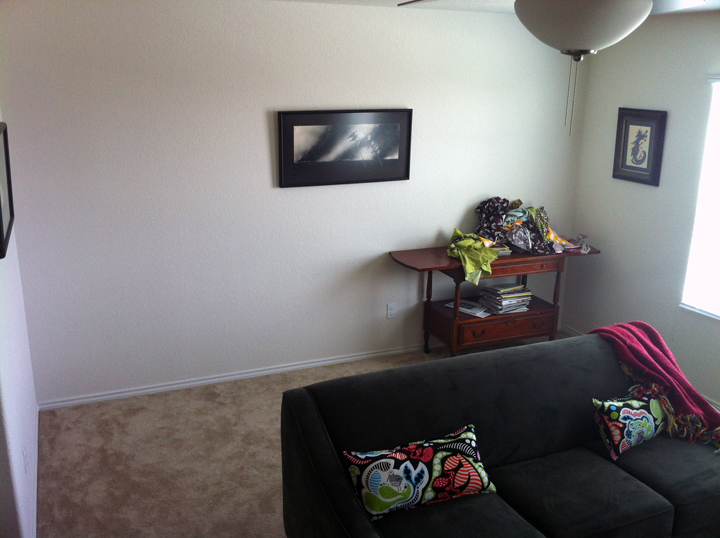 I have two couches and a coffee table in there too. I plan on moving the official “play area” up with me but I will make sure to have a second seat just for you!